I don’t know about you but I just wish we could see some sunshine down here. It seems like it has been over a week now, nothing like you people up north though. I know when the snowbirds are huddled inside the clubhouse instead of on the golf course it is cold outside. Honestly though we get a lot of Canadian tourists this time of year and they are going to play golf no matter what the weather is, they paid for it they are going to play. Which brings me to a topic on golf that if you are playing new courses, and are serious about your game, Garmin has a number of options that will take a few strokes off your handicap. The Approach line of golf GPS from Garmin extends to the user course and shot information like distance to the pin or hazards, they also can measure how far you are hitting your clubs that day to assist in selection for your next shot. Whether you want to wear one on your wrist or belt Garmin has you covered. Wow the weather here has been terrible for a couple of days. We even saw SNOW, can you believe that? The worst though was the sleet and freezing rain, it didn’t last long but was enough to create a few accidents by drivers who weren’t paying attention to the condition of the road. It always amazes me that drivers seem to always believe if they can go forward all is good, without giving any consideration to whether they can stop or turn. Road safety during weather like this, is a priority, you need a good coat, gloves, boots, and a hat just in case you have to walk because you are stuck. Speaking about being stuck, boaters should take a look at their safety devices too, just to make sure they are current and acceptable to the USCG and their inspections. Be responsible and do not take shortcuts when it comes to boater safety, it could well mean your life when you need them. Rainy and warm this morning in NC but supposed to turn cold and maybe snow (I did write snow) overnight, so I know people further south are in trouble if that is the weather. Here we have so many transplants we tend to be a little better at handling 1/4″ of snow. Well everyone is getting back into the swing of our day to day routine, but the boat show crew will be looking for a couple of days off to recover. I remember when they didn’t have children in school (or even children) and they would just take off on a great week retreat with their wives; my how times have changed. Last week was Ash Wednesday so Easter will be about 6 weeks away which means tourists to us. Seems like most teachers from snow country, east of the Mississippi, head to Myrtle Beach for some beach and sun time. I hope it is warm for them and they do get a break. Racing season started with the Daytona 500 on Sunday and I was very happy to see that one Ford get to the front and win, I know it made the Chevy drivers very unhappy. I guess I shouldn’t have shown favoritism there but what the heck let it go NASCAR will make a rule change if Ford wins two in a row. If you are planning on travelling by car over the Easter or Mid Semester break make sure you have a GPS that has up to date mapping, it will make your trip less stressful. Hope you all have plans to do something you are looking forward to this weekend. I had a chance to speak with Brian and Scott regarding some of the new products unveiled at the Miami Boat Show. First of all was Furuno and their new TZtouch2’s that are combination touch screen MFD’s that have the RezBoost feature which produces fish targets 4 – 8 times clearer than their standard FishFinder technology, and here is the best part it takes their standard 10 pin connection so if you are running a Furuno DFF1 or earlier Fish Finder just connect your transducer and you don’t have to remove or re-install a new transducer. The next one is Garmin’s Panoptix their all seeing sonar which really had an impressive demo so the guys said, because you can now see fish or bait swimming in real time either under or in front of your boat with the new LiveVu/RealVu features. It was good to walk in and see a full floor of sales people this morning, although Brian and Scott have red eyes from travel. The Miami Boat Show is over for another year and we are happy for that but looking forward to next year. I heard on the radio this morning that now people who are here illegally and are caught driving over the legal limit cannot be prosecuted or arrested, this doesn’t seem right to an old fellow like me. The weather channel this morning said that the northeast is going to stay frigid until the big thaw, whatever that means, but it does sound like they are going to be cold and under snow for a while yet. Not much happening here which gives everyone a chance to take a break, get a day or two off and recover from the additional effort that the boat show season brings. Just remember pitchers and catchers report very soon for spring training. Go Yankees. Well the weather has turned frigid in the north and even down to South Carolina. It was 25′ this morning on my way to work but down in Miami the “boys’ are still offering hot deals to warm up everyone looking for marine electronics. They may even have calmed down from the visit to the booth, by the Miami Dolphins Cheerleaders, funny that they visited when Drew and I weren’t there. Check out the picture on our Facebook page. Brian, Scott and Jamie are looking way too happy for married men. Last chance today for the great prices we can extend at the Miami Boat Show, so if you are in the area and in need of marine electronics stop by our booth # 1618. Stay warm and safe and look out for your neighbor, you can never tell when you may be the neighbor in need. Well the first release of new products at the show has come from Fusion Electronics. They have introduced their new MS-UD650 and UD750 entertainment. They both have a new “Uni-Dock” system that protects and charges both compatible Apple iOS systems and MTP Android/Windows devices this is really good news for the boater with Samsung or Windows device they now have the same protection as the iPhone or iPod does. They also released a new AV750 and AV650 with a much improved latch system that will keep the door closed when your boat takes a pounding on the seas as well as a self contained Bluetooth Support so you no longer need to add either the BT-100 or BT-200 device to your package. Well the shoe finally dropped on Furuno’s much anticipated release. Today they displayed their new TZTouch2 the next generation in their touch screen MFD’s. With this release there is the TZTL12F but for the first time they have added built in features like an internal GPS Receiver and internal fishfinder which has their newest technology they are calling RezBoost a 600W or 1kW sounder which will provide 4 to 8 times sharper fish targets. There is also a big brother to the TZTL12F the TZTL15F a 15.6″ touch screen similarly featured. The prices set forth on these two new units is in line with their competition and for the first time with the 12.1″ unit being listed at $3,995.00 and the 15.6″ at $5,995.00. A tremendous jump forward in technology from the well respected Furuno USA. These two new units are manufactured to be compatible with Furuno’s DRS Radars, as well as DFF1-UHD Black box CHIRP Black Box. Additionally the new FI70 Instrument displays were released. The FI70 is a 4.1″ display that is a perfect cosmetic match to NavNet TZtouch, TZtouch2 and the NavPilot 711C. It features a simple and intuitive graphical user interface on a bright, vivid color display, and highly visible in bright sunlight. 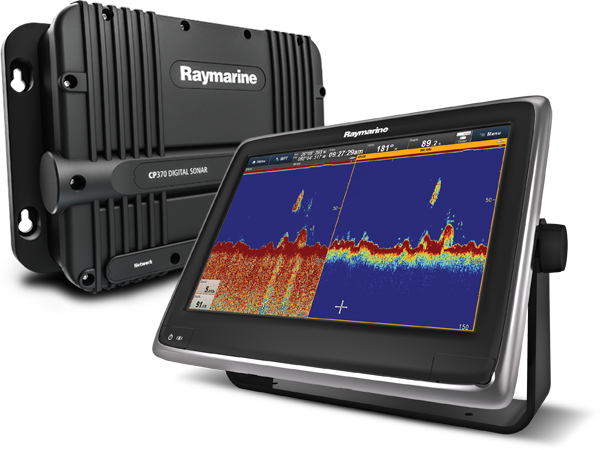 Well it didn’t take long for Raymarine to announce their new releases for 2015. Firt to be announced was a new sounder module a model CP series. The CP stands for Clear Pulse technology which deliver exceptional clarity, and sharper fish targets. The CP370 is a 1Kw black box sounder module operating at 200Khz for Inshore or 50Khz deeper offshore fishing. Adding to the CP line are two sounders offering CHIRP the CP470 for the serious fisherman and the CP570 which is a professional grade sonar module delivering up to 4kW of power with two fully independent sonar channels to deliver fast target identification. Some new vision cameras have also been released, one is the Ocean Scout a rugged compact version and a new M400 a versatile, high-performance pan/tilt marine camera system designed for best-in-class short and long range target identification. A next generation of Dragonfly sounders is also being released featuring Raymarine’s wide spectrum CHIRP but probably the most interesting of these is the new Wi-Fish, that’s right, a wireless black box sonar for Smartphones and Tablets. Garmin has shown their new Panoptix Sonar technology that gives mariners the ability to see all around their boat in real-time – forwards, backwards, sideways, and down – even while stationary. This technology was only available before for offshore commercial use. You no longer have to think you are missing fish that you can’t see because you cannot look in their direction. Also released was BlueChart Mobil 2.0 that adds streaming worldwide weather through a cellular-based Apple device. Also being shown are 4 new 16″ Multi Function Displays two with internal sonar and two without. The 7600 series will come loaded with Garmin BlueChart G2 coastal charts as well as LakeVüTM HD inland lake maps, and two models of the 7400 that come with a worldwide basemap only, lastly Garmin has not overlooked the growing kayak fishing market with their release of an in-hull kayak transducer mount that is compatible with transducers that support all current Garmin echo fishfinders and echo portable kits, as well as the echoMAP “dv” GPS/sonar combos and some GPSMAP GPS/sonar combos.